In 1980, there were exactly four professional bike racers in America. Six years later, an American cycling team would wear the coveted yellow jersey of the Tour de France. And that same team would go on to win Italy's greatest race--the Giro d'Italia--only two years later. Team 7-Eleven is the extraordinary story of how two Olympic speed skaters, Jim Ochowicz and Eric Heiden, pulled together a small group of amateur cyclists and turned them into one of the greatest cycling teams the sport has known. From humble beginnings in a barn in Pennsylvania to soaring victories in the French Alps, Team 7-Eleven is the complete history that has never been fully told--until now. 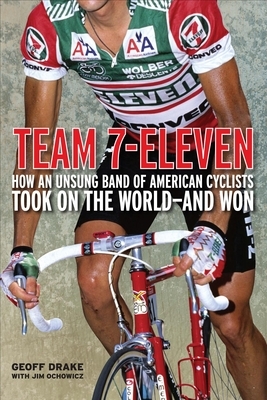 The 7-Eleven Cycling Team--Team 7-Eleven for short--launched the careers of American cycling superstars Andy Hampsten, Davis Phinney, Bob Roll, Ron Kiefel, and many more. It also changed the cycling world, creating a new team structure based on multiple stars, unified goals, and personal sacrifice for the greater good. And yet at the time it was formed, the number of American cyclists with world-class experience could be counted--literally--on one hand. And the number of American teams that competed in Europe's biggest races was exactly zero. Geoff Drake is the former editor of Bicycling and VeloNews magazines, and has covered cycling events worldwide including the Tour de France and Olympic Games. He also writes regularly for national motorcycle magazines and is the author of Smooth Riding, a motorcycling book. He is an avid cyclist, a Category II road racer, and an Ironman(R) triathlete. He lives in Aptos, California. Jim Ochowicz is a two-time Olympic cyclist and former speedskater who cofounded the 7-Eleven cycling team in 1981. He managed 7-Eleven through 1990 and its successor, the Motorola Cycling Team, through 1996. He served four years as president of the board of directors of USA Cycling, and is currently the manager of the BMC Racing Team. He was inducted into the U.S. Bicycling Hall of Fame in 1997.